Read the terms & conditions at the bottom of the page. We’re offering four weekend tickets including camping to Valley Fest 2018, 3rd-5th August on the beautiful Chew Valley lake in Somerset. Great music, great food, and a beautiful site. Even better? We're throwing in one Weleda Skin Food Facial to the lucky winner. Set beside the stunning Chew Valley Lake, Valley Fest 2018 promises good music, great vibes, irresistible organic food and a variety of fun activities for kids. Relax with Weleda for half an hour of organic bliss, leaving you rejuvenated and raring to go for more festival fun! 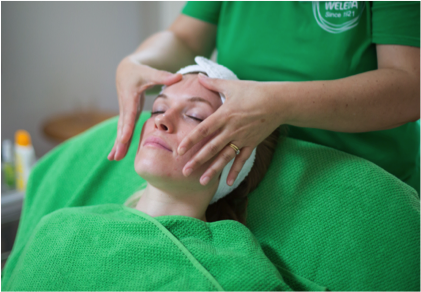 The Weleda Skin Food Facial is a radiance-restoring treatment in the pampering twin treatment tents in the Weleda Wellbeing Area. Weleda’s signature facial is given using gentle skincare products that are all NATRUE-certified authentically natural and organic, and lasts 30 minutes. You’ll leave glowing! You also get a little travel-sized pack of wonder-product Weleda Skin Food to take away with you. Competiton closes midnight 23rd July 2018. Employees of Weleda UK or their family members or anyone else connected in any way with the competition or helping to set up the competition shall not be permitted to enter the competition. Only residents in the UK are permitted to enter the competition. Closing date for entry will be midnight 23rd July 2018. After this date, no further entries to the competition will be permitted. The winner will be chosen from the qualifying entrants by a member of the Weleda Marketing Team. There will be 1 winner selected for this competition. The winner will be notified by email and/or phone within 2 days of the closing date. If the winner cannot be contacted or does not claim the prize within 5 days of notification, we reserve the right to withdraw the prize from the winner and pick a replacement winner.